Carter Pennington has resigned as President, and the VP, Avery Marder is acting interim President. Mike Burns has resigned as Treasurer, and Allyson Cohen (yup, thats me) has taken over as Treasurer, and will also continue to be the Director of Social Media. As we start the new year, lets keep the support for the Task Force strong. They are working hard to protect this awesome hobby of ours! **Please note, this post is for informational purposes only. I do not speak for the Task Force, all inquiries should be directed through the appropriate link on their website. Thank you, and Happy Hunting! I was thrilled to see this update. 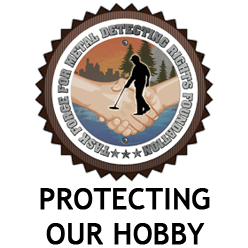 I live in a city that currently has a ban on metal detecting in over 120 of the metro-area parks. I’ve heard that the Task Force will be coming here in the near future to try to offer some assistance, so I check their website several times a week looking for updates. I definitely appreciate what they do for all of us to protect our hobby. Hey Allyson, I’m in Louisville. Things have been tough for us here for a while. I’m hopeful that we will see some changes coming soon based on the past successes of the Task Force. Cross your fingers for us!